Nissan is bringing you a sophisticated, robust, and powerful SUV to the 2018 model year with the Nissan Armada. The Armada features a cabin space that is larger than most other vehicles in its segment, including the ability to fold every row to create almost 95 cubic feet of space. This SUV also features amazing handling, with great bakes, and smooth steering. The design is refined and stylish and allows for the look to speak for itself. The 2018 Armada stays very similar to the 2017 model, but still manages to upgrade to a standard 8-inch touchscreen display, hands-free text messaging, HD radio, and additional charging ports. What are the safety features offered in the Armada? There are many impressive safety features with the 2018 Nissan Armada. Some of the standard features that you will find on the base trim SV are front and rear parking sensors, automatic LED headlights, and a rearview camera. The higher level trims, SL and Platinum, offer a 360-degree top-down parking camera with moving-object detection and warning, blind-spot monitoring, forward and rearward emergency automatic braking, rear cross-traffic alert, an upgraded rearview mirror, and adaptive cruise control. How many trim levels are offered with the Armada? There are three distinct trim levels available with the 2018 Armada. The first is the SV, offering a 60/40-split third-row seat, a reclining second-row bench split seat, a leather-wrapped steering wheel, power-adjustable heated front seats, dual-zone automatic climate control, front and rear parking sensors, a rearview camera, keyless ignition and entry, side steps, roof rails, automatic LED headlights, 18-inch alloy wheels, two USB charge-only ports, two USB media inputs, HD radio, satellite radio, a 13-speaker Bose audio system with a CD player, an 8-inch touchscreen display, a navigation system, and Bluetooth connectivity. The mid-range trim is the SL, giving you an enhanced 360-degree top-down parking camera with moving-object detection and warning, a 120-volt power outlet, leather door trim, leather upholstery, driver-preferences memory, a power-adjustable steering wheel, remote engine start, rain-sensing wipers, and 20-inch wheels. The top trim is the Platinum, offering an upgraded rearview mirror, a rear-seat entertainment system, a heated steering wheel, heated second-row seats, heated and ventilated front seats, speed-sensitive steering, and 20-inch wheels. There are a few different package options with each trim. You can add the optional Driver package to the SV, giving you an auto-dimming mirror, a trailering package, a power-adjustable third-row seat, foglights, and power liftgate. The SL offers a Premium package, adding rear cross-traffic alert, blind-spot monitoring, emergency automatic braking, and a sunroof. Finally, there are two packages offered with the Platinum trim. The first is the Captain’s Chairs package, giving you a center console with a padded armrest and two bucket seats. The second is the Platinum Reserve package, giving you two-tone leather upholstery and special exterior trim. What is the standard engine in the 2018 Armada? The standard engine with the 2018 Nissan Armada is the powerful 5.6-liter V8 engine, which creates 390 horsepower and 394 pound-feet of torque. You can find this engine with standard rear-wheel drive, but you can change to the optional four-wheel drive. The seven-speed automatic transmission is paired with the engine. 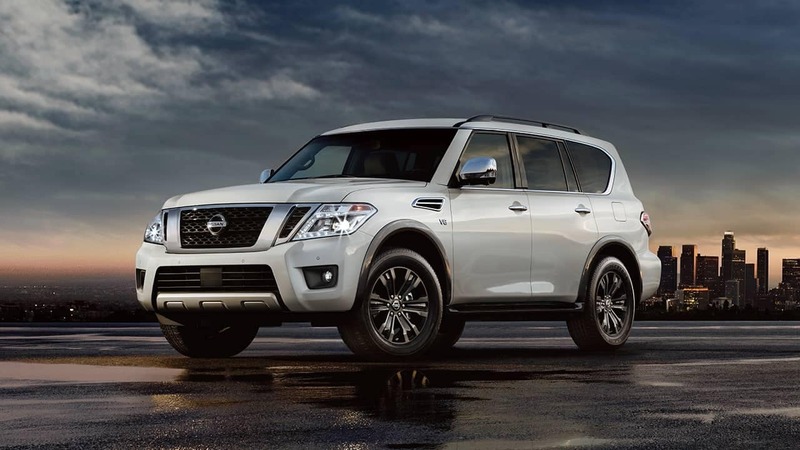 The 2018 Nissan Armada is at the top of its segment with a sophisticated look, a powerful V8 engine, and more space than most of its competitors. There is truly nothing the Armada does not have, especially if you are a technology lover. Want to find out more? Send in your questions using the form below, or schedule a test drive with us today!